In the latest Behind the Scenes: Carnival Vista video series, host Peter Gonzalez travels to the Fincantieri shipyard in Italy to take viewers on a tantalizing tour of the ship's variety of food and beverage choices, which are enhanced by the vessel's breathtaking connection to the sea. The video can be viewed here (or down below). 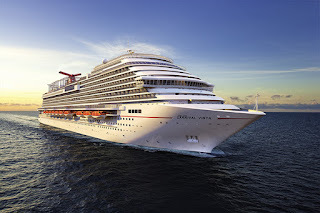 Taking the ship's name to heart, Carnival Vista will offer 12 different indoor/outdoor culinary and bar concepts, from a classic American steakhouse called Fahrenheit 555 to the RedFrog Pub featuring the line's first on-board brewery and the Cherry On Top sweets store featuring a new mixed-to-order ice cream venue. Gonzalez chats with Carnival President Christine Duffy about her favorite culinary choices on board, including Bonsai Sushi and Ji Ji Asian Kitchen, as well as the thought process behind Carnival Vista's concept of offering guests the option of dining indoors or al fresco. Gonzalez also heads over to the studios of Big Time Design where President/Owner Callin Fortis discusses his company's role in creating the stunning interiors for Carnival Vista's two main dining rooms, which he describes as "true urban restaurants" with open, airy yet intimate spaces. All of these exciting venues – and more – will be featured on the Carnival Vista which is set to debut from Europe May 1, 2016. Following its inaugural Mediterranean cruise schedule, Carnival Vista will reposition to New York for a pair of sailings in November then launch year-round Caribbean service from Miami later that month.